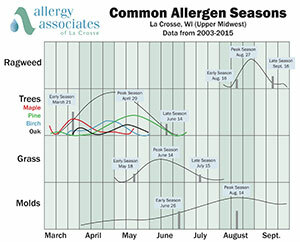 Allergy Associates of La Crosse is an official certified pollen count station reporting daily allergen counts to the National Allergy Bureau, a section of the American Academy of Allergy Asthma & Immunology Aeroallergen Network. 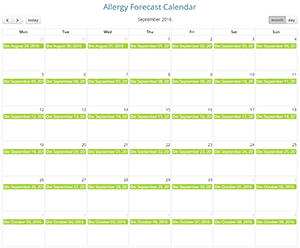 Starting at the end of March or early April, airborne pollen is collected multiple times per week from Onalaska, WI. Pollen counts are measured per cubic meter of air as collected in the last 24 hours. Counts are collected and published on our website until the end of the busiest pollen season, usually early October. Learn more about environmental allergies. Additional information about pollen count stations across the U.S. can be found on the National Allergy Bureau website.